Home » Design » Digital Marketing or UX: What’s the Best Path for You? Digital Marketing or UX: What’s the Best Path for You? It’s never too late to hit refresh. Whether you’re a recent grad or a seasoned professional looking for a career change, the digital world is a growing, ever-evolving arena with many different branches that vary greatly in terms of necessary skill sets and degrees. Digital marketing and user experience (UX) are two of these branches. So, what’s the difference between the two? And, what do you need to do to land a career in either field? Digital marketing revolves around revenue generation. The company’s well-being is at the core. Most fields require analytical, business-oriented skill sets. UX design revolves around the customer and their feelings. It’s about giving the customer the best possible experience to make them want to come back. UX requires design knowledge, as well as soft skills such as empathy. Marketing has always been about connecting with the right audience at the right time. In order to do that, you need to be where your target market is. In years past, that meant advertising in magazines, on TV, via billboards, and through other out-of-home media. While those are still relevant today, what has become more important is marketing online. This is digital marketing. As you can imagine, there are many different types of digital marketing, each focusing on a different channel and requiring a specific set of skills. What Are the Skills Recommended for Digital Marketing? Analytics: An analytical mindset is one of the most important attributes a digital marketer can have. As a digital marketer’s goal is to meet certain key performance indicators (KPIs), you must know how to read and understand data to determine whether you’re hitting your goals. Creativity: As a marketer, it’s imperative for your brand to stand out from the competition. Whether it’s through beautiful website design or compelling email subject lines, you need to be creative in order to capture consumers’ attention. Curiosity: Digital marketing is constantly evolving. Do you have a smart speaker yet? You certainly didn’t three years ago, and marketers who weren’t keeping up with digital trends wouldn’t have known to optimize their SEO for voice search. Marketers need to keep up with technological trends and new marketing platforms and always be open to new techniques. Reading marketing blogs, attending seminars, and simply networking can help you do this. Solution-Oriented: In addition to keeping up with technological advances, marketers must be adept at problem-solving. One of the best parts about digital marketing, compared to print marketing, is the ability to quickly (and cost-effectively) pivot when need be. Digital marketers should stay calm under pressure and always ready with a plan B. The four skills listed above are important no matter what field of digital marketing you pursue; if you know the field you want to enter, you’ll need to develop additional skills. If you want to work in social media or content creation, for example, you’ll need to have strong writing skills, as yours will be the voice of the company. If you wish to pursue affiliate or paid marketing, you’ll need a bit of technical knowledge, such as how to build a landing page, how to set up ads, or how to monitor budgets. Email marketing, on the other hand, requires basic HTML knowledge. Common backgrounds for digital marketers include journalism, business, communications, finance, and design. Let’s take a look at some of the career specializations within digital marketing, what they pay, and what skills will help get you there. Digital marketing entails marketing a product or brand through digital channels with the goal of driving brand awareness and lead generation. As you can imagine, there are a plethora of ways to do this. 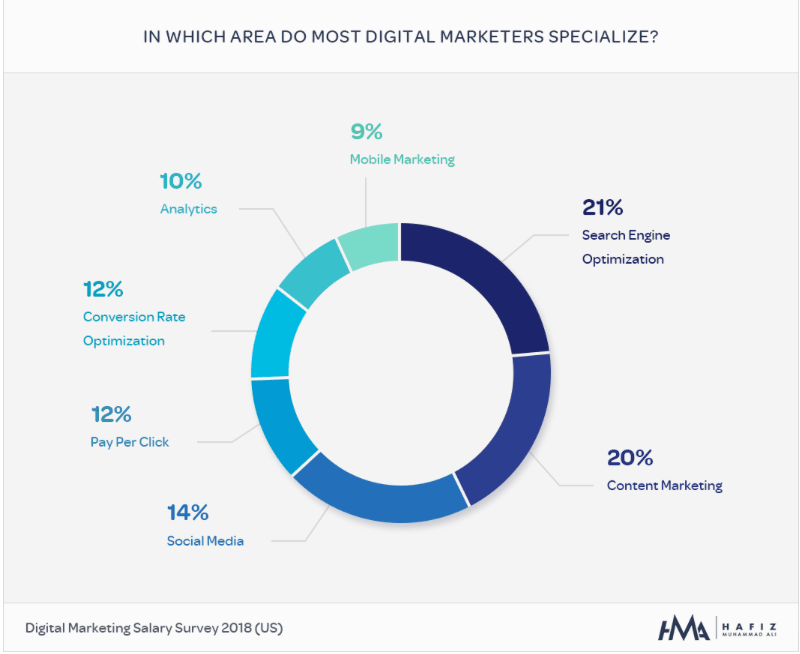 Below, we’ve listed a few of the most common digital marketing fields and what skills are recommended to land a job in each field. We looked at Payscale for these requirements, as well as to give you an idea of average salaries. Skills: Some understanding of coding languages such as HTML and CSS, knowledge of best practices across search engines, ability to read and interpret data, proficiency in Google AdWords and Google Analytics, and knowledge of search engine trends. Salary range: $31,000 – $64,000, with a median salary of $43,500. Skills: Strong editorial skills, project management, understanding of SEO best practices, and knowledge of social media. Salary range: $44,000 – $92,000, with a median salary of $64,000. Skills: Excellent editorial skills, creativity, proficiency in all social channels, experience in public relations, knowledge of Photoshop or other photo editing software, knowledge of social media programming software, and understanding of social media trends. Salary range: $33,000 – $78,000, with a median salary of $50,000. Skills: Strong analytical skills, proficiency in Google AdWords, ability to analyze and report on campaigns, proficiency in keyword research and keyword trends. Salary range: PPC managers make between $36,000 and $66,000, with a median salary of $50,000. Skills: Excellent communication skills, strong analytical and multitasking skills, ability to manage budgets. Salary range: $37,000 – $75,000, with a median salary of $55,000. Skills: Proficiency in email marketing and tracking programs, knowledge of HTML, data analysis and interpretation, strong attention to detail, and editorial skills. Salary range: $39,000 and $70,000, with a median salary of $50,000. What Is the Demand for Digital Marketing? In 2017, paid marketing, content creation, and social media were among the most in-demand fields within digital marketing. Forrester doesn’t mention SEO (organic search), but it shouldn’t be neglected either, as the SEO industry is estimated to grow to $79 billion by 2020. What does this mean for you? Not only does it show that digital marketing is a growing and thriving industry, but it can help you decide which field to specialize in. If you look at the above graph on 2018 specialties, you can see that the SEO and content marketing specialties are relatively saturated, but PPC and social media are lower. As the demand for PPC and social media are predicted to grow over the next few years and have relatively low saturation, we recommend you check out these fields. We’ve already told you what skills digital marketing hiring managers look for, but what else can get you in the door? In addition to specific skills, hiring managers typically prefer candidates with a bachelor’s degree and experience in a similar field. If you don’t have experience, that doesn’t mean you won’t get hired; it simply means you need to focus on honing your skills to prove you’re up to the task. This can be done by shadowing someone in that field you wish to enter, as well as through online courses that help you develop job-ready skills. Now that we’ve given you some insights into digital marketing, let’s explore UX. At its core, user experience is the process of making websites, apps, and other pieces of technology (plus physical products) as easy and delightful to use as possible thanks to consumer-friendly designs. UX is more design-focused than digital marketing, but that doesn’t mean you have to be a visual design expert to work in the field. What Are the Skills Recommended for UX? Empathy: In order to build a product or website, you must understand who will be using it. Who is your target market and what motivates them? Why are they using your product? Design: While consumer behavior may be at the core of UX, design is how it manifests. Whether you’re a UX researcher, architect, project manager, or hold another role, you need to be comfortable with basic design fundamentals and terms. Curiosity: Technology is constantly evolving and the design world needs to keep up. It’s imperative for UX teams to stay abreast of trends. Subscribe to a few blogs, bookmark a few sites, and try to read at least one new post every morning when you wake up. Thick Skin: At the end of the day, design is subjective, and UX teams must be receptive to feedback. You need to be able to take a step back and put your customer hat on. If you get too close to a project that can be hard, which is why you should always be open to suggestions and never take them personally. Common background for people starting out in UX include psychology, sociology, anthropology, and other social sciences. Many people think they need to have a degree in design to work in the UX field. This isn’t true, and in fact, most UX professionals are self-taught. The two primary UX fields are UX research and UX design. We’ve listed they key responsibilities for each, as well as what you can expect in terms of salaries. 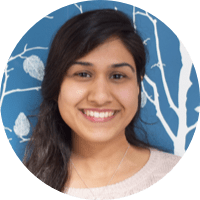 UX Researcher: In order for a UX designer to create a product that is easy and intuitive to use, the designer must understand the target market: what the consumer wants, what motivates them, and what turns them off. This is the job of the UX researcher. 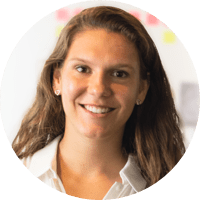 The UX researcher conducts a mix of quantitative and qualitative research, including surveys and interviews, to better understand the target market. Skills: Empathy, strong communication, an analytical mindset, in-depth understanding of UX/UI design, experience conducting user research sessions, understanding of qualitative and user-centered design methodologies, working knowledge of quantitative analysis and statistics, critical thinking, and problem-solving skills. Salary range: $56,000 – $120,000, with a median salary of $83,000. Skills: Creativity, understanding and dissecting consumer research, competency with wireframing and UX writing, visual communication, some coding, knowledge of key design elements and programs. Salary range: $56,000 and $100,000, with a median salary of $73,000. 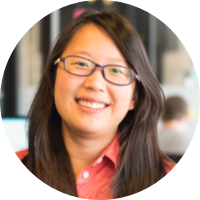 For a more thorough breakdown of salaries by job title, check out our UX Designer Salary Guide: From Junior to Principal Designer. And you can find a more granular look at UX job titles here. The demand for design jobs—and UX in particular—is at an all-time high and its upward trend is expected to continue. The demand outstrips the supply, which has resulted in UX designer was named No. 1 on Onward Search’s list of the 18 most in-demand talents in the digital, creative and marketing space (user researcher ranked No. 11). It also ranked 27th on Glassdoor’s list of the Best Jobs in America. If you have the skills and interest, now is definitely a good time to get into the UX field. In addition to the aforementioned design and research skills, hiring managers want to see a portfolio showing examples of your work. It doesn’t matter if these examples are from an internship, a “real” job, or even just made-up projects: the most important part is proving you have what it takes to be a UX designer. 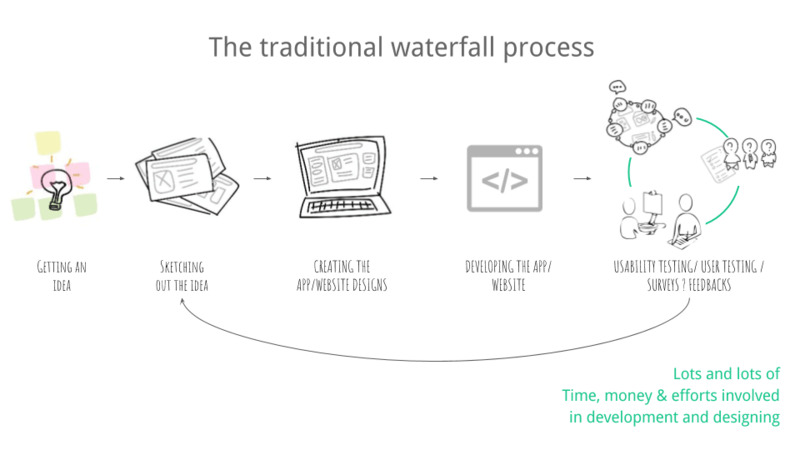 Your UX portfolio should illustrate the what, how, and why of each featured project. What the problem was that you solved, how you approached the problem, and why you chose the path that you did. Portfolios give the hiring manager a sense of who you are and how you operate, and provide a more complete picture than a list of skill sets ever could. Digital Marketing or User Experience: Which Should You Pursue? We hope the above helped provide a more comprehensive idea of the differences between digital marketing and UX. To summarize, both are on the upward trend and are secure career paths. Digital marketing places a greater emphasis on analytical and business acumen, with a priority on increasing sales through customer conversion. 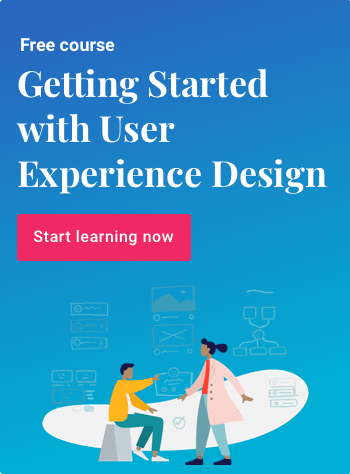 UX is more centered on design and empathy, with a focus on creating the best possible experience for users, whether that improves the bottom line or not. Both, however, require creativity and curiosity. At present, there is greater demand for UX, which has resulted in higher starting and median salaries than digital marketing. While job demand is higher in UX, you may find it easier to break into digital marketing. If you are applying for UX jobs, you will be required to present a portfolio showcasing your work; thus, you will need demonstrable experience. If you are applying for a digital marketing position, however, your biggest challenge will be selling yourself. If you answered mostly As, you may be better suited for a digital marketing career. If Bs, perhaps UX is the field for you. No matter what you choose, you’ll find a healthy job outlook. If you want to learn more about what it takes to be a digital marketer, check out Springboard’s digital marketing bootcamp. If you think you’re better suited for UX, find out more about Springboard’s UX Career Track.